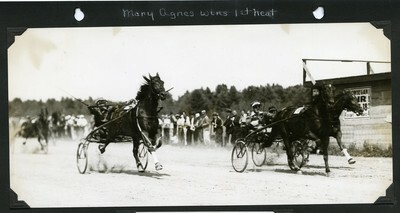 Black and white finish line action photo of the first heat of the first race of the 2.24 Trot at the Western Maine Agricultural Exposition, Cumberland County Fair Trotting Park, Gorham, Maine, August 1934. The heat was won by bay mare Mary Agnes, Jordan up. Second place in the heat was taken by bay gelding Alloway, Wathen up. Miss Guy Song driven by Wilfore, showed in the third position. The fourth and fifth horses in the contest, Calumet Chimes and Evening Express can be seen in the distance.